Enough has posted an interesting play-by-play of the Doha process that is worth the read. It states that “The African Union-United Nations mediators, the Qataris, and the U.S. special envoy all seem to support the parallel negotiation track.” What Enough is referring to when they talk about a “parallel negotiating track” is that the Doha mediation, having reached a GOS-JEM agreement, is now trying to get another agreement between the GOS and the many rebel factions outside of JEM. This alone seems problematic enough when you now have a GOS-JEM agreement stating that matters such as the administrative reorganization of Darfur (Art. 9), wealth-sharing, and land (Art. 10) will be decided “between the two parties” (i.e. GOS and JEM). What is the incentive for other rebel groups to negotiate anything if they are, a priori, excluded as parties to negotiations over such vital matters? Surely the GOS-JEM agreement will have to be set aside in order for there to be any progress with the other rebel groups. However this is not the only “parallel process” issue at play. As an adviser to the Mbeki panel it’s no surprise that de Waal speaks well of Mbeki’s approach. But what he says is also true; Mbeki has been clear that an agreement must include all parties. Yet such an agreement, while the only real solution, is a much tougher nut to crack, and is made all the more difficult when JEM, the GOS, or any other group can do one-on-one deals working through the Doha process. Some staffers at the UN have expressed to me their fear that the Mbeki process was initiated at Khartoum’s insistence precisely in order to create a forum shopping scenario and, in their view, to undermine Bassolé. As the official UN-AU mediator Bassolé is “their guy” and so when they talk about undermining Bassolé what they are also fear is that the UN is undermined by the Mbeki panel. On the other side are those who fear that with the Qataris spending their largesse on the Bassolé process, there is some kind of Arab conspiracy at play that will ensure nothing good comes out of Doha for non-Arab Darfuris. As far as I can tell, none of these rumors and allegations have been backed up. 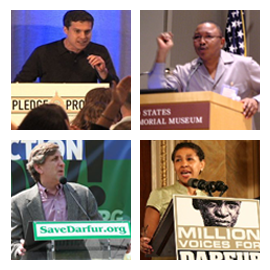 But regardless of the truth or falsity of the claims, the fact that these concerns exist undermine both processes; a peace process, whether Bassolé-, Mbeki-, or anyone else- led, must to be seen as legitimate in order to gain the broad acceptance that a lasting deal for Darfur will ultimately require. At some stage there will have to be an integrated end point. Will the UN and the AU show the kind of mature leadership that will be needed to accomplish this? I agree with you that what is important is a credible comprehensive definite peace process to settle the issue in Dar Fur ,which by the way,is an issue of the whole Sudan.However the problem of Dar Fur is complicated by the number of movements in the field,whether they command real following or not,hence this talk of( parallel negotiating track). I am however concerned about the reference to an (Arab conspiracy),for this misguided classification of the conflict in Dar Fur as an(Arab-African conflict).It was this simplification of the conflict,that led to these complications,some advocacy groups used it to grin their own axe. No races in the world are as organically related as the Arabs and Africans ,yet the divide is over-played by some quarters,ironically,some religeous groups,tend to advance this divide too,as if they never read the Old Testament. As for the Bassole-Mbeiki approaches,i simply note that they do not contradict each other,they instead compliment each other,as each one starts from different mandate. It is regrettable though,that some UN Staffers tend to look suspicously at the Mbeiki group,while they ignore some UN Teams that deliberately undermine Bassole himself,and in any case,Bassole’s term ends in June,and i dont see,though like you,I hope too,that a comprehensive settlements can be reached before June. Meanwhile one cannot but encourage any move towards peace,though peacemeal,ideally though Mbeili’s recommendations seem to provide a comprehensive frame.